At one end of the spectrum is the Canterbury Historical Association’s lecture, given yesterday evening by Professor Christopher Tyerman on ‘How rational were the Crusades?’ This comprises the international dimension, and I’ll touch on it later, but for now I’ll start at the local. Yet, as will become clear, I hope, all of these interlink, which means the history of Canterbury has implications way beyond the city’s liberty, and equally what happens elsewhere, including beyond the seas, has ramifications for those living within this same liberty. 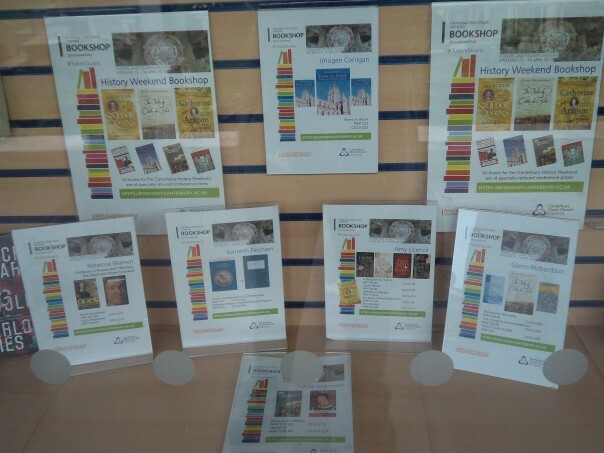 Furthermore, such delving into the past is not a dry pursuit only undertaken by historians and archaeologists as part of their professional or academic lives, their research retained within scholastic journals, but is something that enriches and belongs to all in society. Thus, local, regional and national heritage are vital aspects of any community – how it came into being, the influences, internal and external upon it, the responses and initiatives undertaken – that together provide a sense of place, identity and belonging. 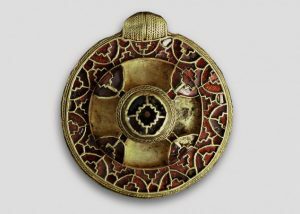 I am going to begin with a meeting on Wednesday afternoon that took place in Canterbury Cathedral Archives and Library at the invitation of Cressida Williams, the manager there. She had invited members of staff from Canterbury Christ Church and the University of Kent who frequently use the resources there for their own research, both in terms of their own research and as a means of teaching undergraduates, postgraduates and others. Karen Brayshaw, the cathedral’s librarian, was also present, as well as cathedral colleagues from the ‘Canterbury Journey’ project, Jane Gallagher, Special Collections’ librarian at Kent University, and Paul Bennett, the Director of Canterbury Archaeological Trust and Visiting Professor at CCCU. From the number of conversations that were taking place in the search room, the meeting was a great success as staff members from all sides found common ground and shared interests. Not that such discussions had not taken place before elsewhere, but the space offered opportunities for people who often because of other institutional commitments do not have the time to think more creatively about research, student engagement and extending this more widely beyond the university curriculum. Moreover, both universities have recruited new staff in the last few years and this opportunity was especially valuable from their perspective. To provide an idea about the type and range of primary sources held by the archives and library, Cressida ushered the group over to the library. Three display cases had been set out. 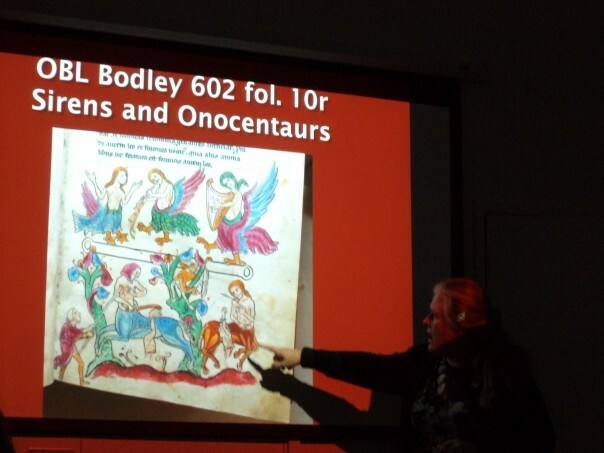 Looking at the first case, Professor Louise Wilkinson showed the group the value of three 12th- and 13th-century charters in terms of her second and third year modules. 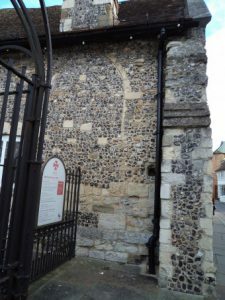 Of particular interest were the seals, including one of Eleanor of Castile, and that the charter relating to land held by Jacob the Jew (the corner of Stour Street and the High Street – the Abode Hotel site) includes in English ‘Heathenman Lane’ (the old name for Stour Street). 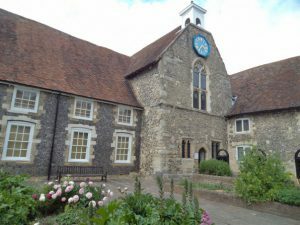 The second case had material from Canterbury Catch Club from the early 19th century (started in 1779 and met for almost a century), discussed by Chris Price senior lecturer in Music and Performing Arts at Canterbury Christ Church – see: http://www.c3urecords.co.uk/canterburycatch/ ;while the third case contained books linked to Shakespeare and his contemporaries – see: https://www.canterbury-cathedral.org/heritage/history/shakespeare-400/ . Such collaboration would seem to be vital if Canterbury as a whole is to take fullest advantage of the wonderful historic buildings, brilliant documentary sources, amazing artefacts and exceedingly knowledgeable people who live and work in and around the city. This holistic approach, especially in challenging financial times, requires, it seems to me, imaginative thinking and a creative approach that looks beyond the very short term. For once lost, much of Canterbury’s heritage will be difficult or impossible to recover. Furthermore, for example, the Medieval Canterbury Weekend showed the appetite of locals and visitors alike to learn more about the buildings in their midst. Indeed, tickets for Paul Bennett’s guided tour of the Poor Priests’ Hospital sold out very quickly and such was the success of the Weekend that a donation of £1,000 was given to the city council towards this iconic medieval building after the event (as it was to each of the other three buildings). Yet, this very building, the Museum of Canterbury within it, and public access to the museum and building that are now under very serious threat. As readers of the blog, you may wonder how this can possibly be the case considering that the Canterbury Heritage Museum IS the Museum of Canterbury; and how can a city of Canterbury’s historic importance possibly claim it cares for its heritage if it shuts the only place that tells the city’s story from prehistoric times until the present day? Moreover, not only does this internationally important story cover the city’s pre-modern past, but the Museum has within it the restored locomotive ‘Invicta’. This locomotive, and three stationary winding engines (to cope with the gradient), operated from May 1830 to transport passengers on the line from Canterbury to Whitstable, three months before the far more famous very early passenger line of the Liverpool and Manchester Railway. It is also worth noting that some of the winding gear still survives – in Gas Lane in the open next to Canterbury Castle, a fate that befell Invicta until it was ‘rescued’ from outside the city walls, with restoration work beginning in 1977 helped by the National Railway Museum. 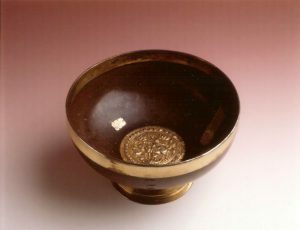 The presence of such items, and far more besides (my favourite being the wonderful and important collection of mazer bowls from the early 14th century owned by St Nicholas’ hospital and on display upstairs in the late 14th-century rebuilding that formed the master’s lodging) are valuable for researchers and enjoyed by visitors, including schoolchildren and students. Consequently, rather than giving up on the Museum, mothballing most of the exhibits and ‘cherry-picking’ what are seen as the ‘best’ items for display at The Beaney, it would seem imperative, I believe, to bring together as many interested parties as possible to work together to build an holistic strategy that strengthens ALL of Canterbury’s attractions. For, if Canterbury has no museum of the city’s history and heritage it will, from my perspective and that of many others, be a very sad day. Because, as Professor Tyerman’s lecture demonstrated, there is a considerable demand in Canterbury for high-quality history, and people from sixth-formers from Chatham to pensioners from Thanet are more than prepared to brave a bitter January night to come to hear an expert. Other societies, too, draw in comparable audiences, and Canterbury Christ Church, like Kent University, offers members of the public opportunities to attend open lectures, conferences, workshops, and staff-graduate lectures. For example on Wednesday evening this week Dr Lesley Hardy spoke on Richborough and some of its meaning in fact and fiction, thereby drawing on her research on the historic landscape and Kentish antiquarianism. Equally, ticket sales for the Centre’s History Weekend last year and sales so far this year for Tudors and Stuarts point to a continuing healthy interest in history and heritage – positive signs for the Centre and other groups active in Canterbury, as well as the City Council’s new Heritage Champion.